IMDB is horribly unfair to The Giant Gila Monster. Yes, the movie is full of cliches such as the town drunk, the wise sheriff, and a group of crazy kids looking forward to the next sock hop. Yes, the special effects amount to footage of a real gila monster that is made to look gigantic but is about as menacing as a basket full of kittens. Yes, there is a heart-throb crooner who breaks out his ukulele and starts singing cringe-worthy songs. Yes, the scientific explanation regarding how this lizard came to be is ridiculous. But what's not to like about all of the above! The Giant Gila Monster is one of those so-bad-it's-good kind of movies. The thing that saves it is Ray Kellogg's direction. He is a capable director whose visual effects have graced such classics as The King and I, Love Me Tender and The Seven Year Itch. His scene compositions and pacing of the film are solid. He is also able to get solid performances out of his actors. The other thing that works in the film is the eerie soundtrack (minus the ukulele player) which uses the theremin as its main instrument. The atmosphere is perfect for this B-grade creature feature. Jack Marshall is credited as the composer and is best known for the 60's T.V. classic The Munsters. Finally, I speak on behalf of the Gila Monster who terrorized this small town in Texas. Yes, it hokey, but it is on par with other bad monster movies of the 1950's. It's laugh-out-loud funny and I think the filmmakers are in on the joke. 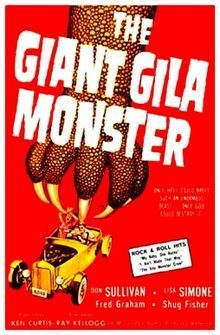 Is the Giant Gila Monster a great film? Not by a long shot! Is it a fun sci-fi romp whose sum is better than its parts? You betcha! Give this one a try if you're a fan of 1950's movies.